Del Mar, pop. 5000, is on the coast 15 miles north of downtown San Diego. It may be possible to completely ignore a Del Mar ticket ! 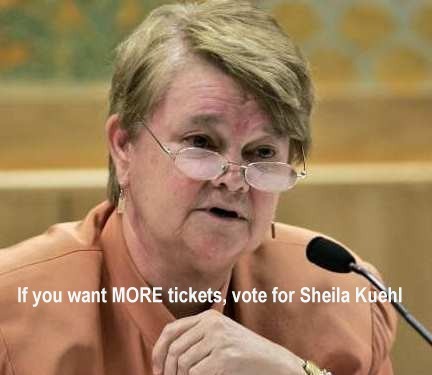 If your "ticket" does not have the Superior Court's name and address on it, it is a fake ticket, which I call a "Snitch Ticket." For more details about Snitch Tickets, see the Snitch Ticket section at the top of the Your Ticket page. 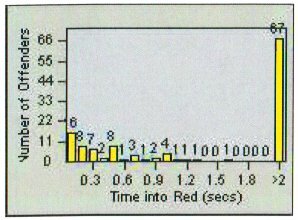 Any figures in red type (or, if you are looking at this table in black and white, the upper figure when there are two or more figures in a cell) are what RedFlex calls Total Violations, or all incidents recorded by the cameras, and due to time limitations may have been posted here only for selected months or locations. If there is sufficient public interest, the remaining months will be posted. The figures in black type are what RedFlex calls Notices Printed, and represent the sum of genuine citations issued (those filed with the court) plus any Nominations mailed (not filed with the court, a.k.a. Snitch Tickets). From the annual reports required, beginning with 2013, by CVC 21455.5(i). They become available by the Fall of the following year. Also see Set # 4, below. From reports received from the Court and the City. For more info about program finances, see Set # 3, below. No report is on hand for June 2017. The June 2017 figures shown above are the difference between the official annual total and the totals of the other 11 months. The 2009 Amendment extended the contract to June 2016. The City can cancel before then, but it must give notice one year ahead of time. Invoices received in June 2013 showed that the City is paying $1578 per camera. A June 2014 article said the City was considering closing the program. At the meeting the council was skeptical about the claimed safety gains but nevertheless voted to continue the program. 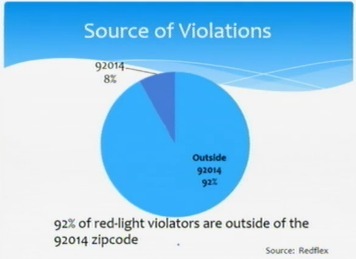 During the meeting staff showed a slide indicating that 92% of the tickets have been going to visitors. The contract was set to expire the next month and the staff recommendation was to renew for another year, but at their May 16, 2016 meeting the council put off making a decision until the Finance Committee (two members of the council) could conduct a review of the program. In June 2016 the City signed a contract amendment, to allow the program to continue month-to-month pending the Finance Committee review. In May 2017 the City sent RedFlex a letter allowing the program to continue month-to-month until June 21, 2018. This listing of contracts and amendments was up-to-date as of June 2017. An official report showed that in 2014, 70% of the City's tickets were for left turns. As of Nov 5, 2010 I could not find any red light camera program info on either the City's or the sheriff's website. There may be some more Del Mar information posted in the next few weeks. Mark your calendar to remind you to come back here and look!